Duck - Rabbit - A Visual Feast! The two elements that make a product stand out as being exceptional rarely come together, and like an eclipse, rarely do they occur. So when you come across a product that manages to achieve both, originality of design, along with exceptional content, it is a moment to relish - and admire. The beer in question was from The Duck - Rabbit Craft Brewery in North Carolina, and on seeing the label for the first time you understood the brewery grasped the importance of originality combined with simplicity, but with an added twist of optical quizzicality! Many beer labels today are works of art in their own right, and in the hands of many label design companies the quest for originality and creativity sometimes loses touch with the fundamentals of the product. The message as to what lay within, in terms of content and style gets blurred as it were, in the translation. Another interesting aspect of the brewery itself is that they claim to specialize in one beer type 'dark' ales. This in itself is a brave move in a country where lighter lager, pale and IPA styles are the mainstay of the industry. But Duck - Rabbit are obviously following a different route and appealing to a niche market who appreciate beers on a different qualitative level. It also makes sense in that the US micro brewers have trail blazed the 'dark' beer cause in recent years, reviving almost forgotten styles. 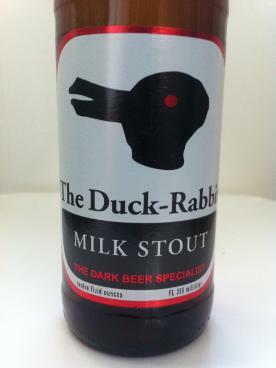 One such style, almost facing oblivion in its native UK, was Milk Stout, a style Duck - Rabbit seem fit to champion. With origins commercially dating back to 1907 in Britain (with Mackeson) Milk Stouts, along with other beers with nutritional leanings such as Cream, Oatmalt, Oatmeal and Oyster were marketed successfully as restorative pick-me ups. In the case of milk stout it was the lactose (a non fermentable milk sugar) which was the 'health giving' property within the brew. Always low in alcohol content, the beer appealed to nursing mothers and the elderly particularly well! Stuck in a time warp as a relic of another age it was on the brink of extinction in the UK. The one point that many brewers seemed to miss was that the style was capable of much more...an injection of alcohol content, and a more defined flavour profile, could see the beer move into something far more appealing for a new generation. And, it was the US micro brewers who could foresee this new appeal in the late 1990's. The Duck - Rabbit Milk Stout is equally impressive in this respect, with a flavour and quality to match its visual originality. The aroma is full and giving with notes of light cream fudge, sweet oatmeal biscuit combined with an Ovaltine maltiness. The flavour is very complex, with a concentrated depth, full, with an almost sweet porridge oat like mix, with a touch of clotted cream, and lightly roasted coffee bean. There is a density to the flavour which allows it to linger on, giving it great length on the finish. One other intriguing aspect of the label was the design itself - why choose the Duck - Rabbit image that juggles with your senses? The reason is the founder of the company Paul Philippon who in his previous life, prior to becoming a professional brewer, taught philosophy at University level. He admired the work of Ludwig Wittgenstein who used the image in his book 'Philosophical Investigations' and the label acts as a fond reminder of his past occupation. Quite what it tells you about yourself in the way you interpret the logo I am unsure - and I think it may be better not to ask! One thing is for sure, it does not detract from the excellent quality within, it purely enhances the enigmatic nature of this dark delight!